If dogs are mans best friend and diamonds are a girl's best friend then how about ... dog harness with a touch of "Bling" for the one you probably love the "most". The sparkle from the Swarovski Stones offer the best style & shine for any well-dressed dog. Genuine Leather K Harness with Genuine Swarovski Stone Cluster. This harness features clear Swarovski stones on the center tab and rows of single med stone with an alternating row of two clear smaller stones. There is a Nickel D-ring that sits on your dog's back for lead attachment and a nickel O-Ring located by the neck buckle loop to attach ID tags. 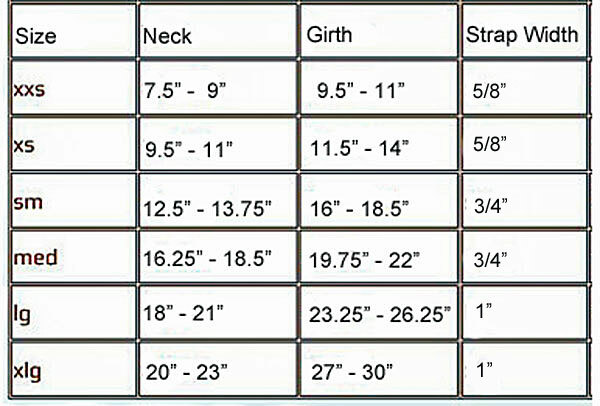 Example - If your dog is a 10" neck and a 13" girth you would order the xs. If your dog, for example, is a 10" neck and a 16" girth he doesn't match the sizes in the chart so please contact us and we can arrange for a custom size made just for your dog. XXS, and XS have 4 holes (neck) and 5 holes (girth) and are 1/2" apart. S, M, and L have 5 holes (neck) and 5 holes (girth) and are 3/4" apart. We estimate delivery as approximately 3-5 weeks but will try our best to get it to you sooner. Quality and attention go into every detail of this handcrafted designer leather dog harness ensuring it will truly be worth the wait.